in bed, every night, for the next eight years. Scene: A meeting room in a high-end office building, sometime in the past few days. Several men are gathered around a large mahogany table. Mike Babcock sits at the head of that table, and gathers his thoughts before beginning to speak. Babcock: OK everyone, let’s get started. I want to thank you all for coming. I know this is kind of unusual, but I’ve got all this interest in my services and not much time to make a decision, so it seemed like the easiest way to do this was to just get everyone in one room at the same time. Babcock: Great. Let’s do a quick roll call. From the Detroit Red Wings, Ken Holland. Babcock: From the Toronto Maple Leafs, Brendan Shanahan. Babcock: Representing the Buffalo Sabres, Tim Murray. Babcock: Doug Wilson from the Sharks? Doug Armstrong from the Blues? Wilson and Armstrong: Both here. Babcock: And finally, from the Oilers… um… huh. Craig MacTavish. Babcock: Um… didn’t I hear that you’re not the GM in Edmonton anymore? MacTavish: Oh, that. Yeah, Peter Chiarelli is in charge now, but I still work there. And he obviously trusts me, because he gave me this super-important assignment. MacTavish: Yep! “You take the Babcock file, Craig!” he said. “Head out on the road and take as long as you need!” he said. MacTavish: That was two weeks ago. Babcock: Are you aware that the Oilers already hired Todd McLellan? MacTavish: I was not aware of that. Babcock: You can go now. MacTavish: I’ll just see myself out. Babcock: OK, so where were we? First of all, I want to be really clear with everyone about where I’m coming from. I have three main priorities in all of this. The first is salary. I have a family to provide for and I’m proud of the work I do, and I want to be compensated for it. Babcock: Second, I’d prefer to have at least some degree of control over player personnel decisions. Babcock: And finally, I need a realistic chance to win, either now or in the future. Wilson: Yeah, thanks for coming out. Armstrong: Better luck next decade. Shanahan (calmly): Actually, I don’t think winning is all that important to you. Shanahan (staring intently into Babcock’s eyes): I don’t think winning is very important to you. Babcock (trancelike): Winning is not very important to me. Murray: Holy crap. Where’d you learn that trick? Shanahan: Just a little something Yzerman taught to me. Wilson: Mind control? That’s ridiculous. Wilson: Actually it’s pretty cool. Lamoriello: Hi guys. Sorry I’m late. Babcock: Um… hi Lou. Can’t say I was expecting to see you here. Lamoriello: Hey, the Devils needs a coach too you know. Babcock: Right, but… you stepped down and appointed Ray Shero as GM. Lamoriello: Yeah, that didn’t work out. Lamoriello: He questioned me. It displeased me greatly. Babcock: OK, so since the topic has come up, we might as well do this now. As you know, I have never thought about money in my life. However, the concept was recently explained to me by my wife, and it sounds kind of important. So how much can you guys offer me? Armstrong: Well, I guess I’ll start the bidding at $2 million. Murray (more quickly): Seven trillion. Armstrong: Uh… two point one million? Shanahan (signals to a dump truck parked outside the window, which backs in through the wall and dumps solid gold bars with little maple leafs stamped in them all over the floor): It’s all yours, Mike. Murray (repeatedly firing a bazooka loaded with diamonds at Babcock’s feet): Dance for me, coach boy! Lamoriello: You will take the spare change I have in my pocket right now and YOU WILL DAMN WELL LIKE IT! Murray: Look, Mike, here’s the deal. I work for Terry Pegula, and he’s given me strict instructions not to be outbid here. You name your best price, we’ll beat it. Murray: Indeed. Let’s just say that when the Buffalo Sabres have their sights set on someone, we do not finish second. MacTavish (poking his head in the door): When did you institute this new policy? Murray: Shouldn’t you be off trying to hire Toe Blake? MacTavish: No, that’s Lowe’s assignment. Babcock: Alright guys, let’s get back on track. I probably should have mentioned this earlier, but with a tough choice like this, I really value the advice of my fellow coaches. So I’ve asked one of my closest friends, most respected colleagues, and a member of my gold medal winning coaching staffs at the 2010 and 2014 Olympics to sit in on this interview. He’s on the speakerphone right now. Everyone OK with that? Babcock: Cool. Are you there, Ken? Ken Hitchcock: I’m here, Mike. Hitchcock: Say Mike, I have a question. Did I hear that Doug Armstrong is there? Armstrong (doing a bad Mike Babcock impression): Um… no! Hitchcock: See, that’s weird, because I’m pretty sure the Blues currently have a head coach. Armstrong: Oh… um… wait, is this the Mike Babcock interview? I’m in the wrong room! I was supposed to be in the “Send a thank you gift to your totally awesome coach” workshop. Armstrong: How silly of me. I’ll, uh, I’ll just be going. Babcock: Thanks Ken. We’ll take it from here. OK guys, let’s talk about job description. What are you actually offering me here? Shanahan: In Toronto, you’ll have the standard head coach duties, and you’ll also be consulted on all player personnel decisions. Murray: In Buffalo, you’ll be reporting directly to the general manager. Since, you know, we actually have one, unlike some placers I could mention. Lamoriello: In New Jersey, you will be the head coach on Tuesdays and every second Friday. Patrik Elias coaches on weekends. 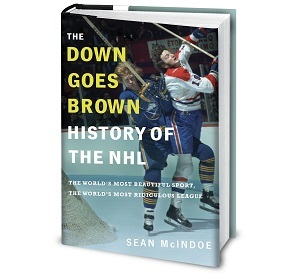 The winner of tomorrow’s bare-knuckle fight between Scott Stevens and Adam Oates coaches Wednesdays. The rest of the time, we will select one random fan from the stands. That person will coach the team until the final buzzer. Then I will stab them. Shanahan: Are you sure that’s a good idea? Lamoriello: Hey, maybe not. After all, we all make mistakes. Lamoriello: Sure. For example, with my first ever draft pick in New Jersey, I took some smartass kid and forgot to give him a good stabbing. Shanahan (calmly): You do not want to stab me. Lamoriello: Try that Jedi crap on someone with a soul, kid. Voice on intercom: Sorry to interrupt you, Mr. Babcock. But the FBI is here. Something about Ray Shero and a missing person report? Lamoriello: I should probably go. Babcock: Wow. Well, I have to admit, guys… I’m stumped. Both the Sabres and Maple Leafs have offered me everything I could want. I’m really not sure which way to go. Shanahan: If it helps, Mike, maybe you could ask one of your former players. Maybe somebody who was on all those Canadian Olympic teams. Babcock: Hm. That’s not a bad idea. Did you have anyone in mind? Shanahan: As it happens, I do know one guy. He’s doing some work at my old job at the department of player safety these days. Babcock: Do you think he’d be willing to jump on a quick phone call? Shanahan: Actually, he’s waiting right outside. Babcock: Well, let’s bring him right on in. Shanahan: Oh hey Chris, thanks for dropping by. Say, I think you know Tim Murray. I was talking to you about him earlier. Murray: This isn't over, Shanahan. Shanahan: Yeah, you’re going to want to start running now. Babcock: Then I guess we pulled it off. Shanahan: We totally did. Just like we planned out over a year ago. 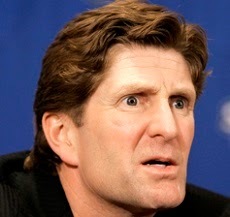 Babcock: I should have known your plan would work… boss. Babcock and Shanahan (high-fiving): Go Leafs Go! Go Leafs Go! Go Leafs Go! Ken Holland: Actually, I’m still sitting right here. Babcock: Oh… um… hi Ken. Babcock: Well, this is awkward. Holland: Honestly, I was just here to tell you we like Jeff Blashill better. Shanahan: Hey, that’s a great hire. Shanahan (calmly): He’ll be a great coach for Dion Phaneuf. It's bazooka not boozaka, but I kind of like boozaka better. Oh man. I'm so glad I still check this site for reasons I can't articulate. I've missed these. Welcome back home DGB ! Please come back from time to time ! A non-Grantland DGB article! Woohoo! How I've missed these. Great post. I was so afraid there would be no Pronger...it wouldn't have been the same without him. Keep these up, I've missed them. Either that or another book, the first one still makes me wonder what your opinion on the shoot out is. Can't believe Murray didn't sell Babcock on the wings in Buffalo. The chicken variety, not the ones on the ice. Buffalo doesn't have too many good ones of those. So great to see this back! Oh you sweet summer child. Who do you think wanted Phaneuf in Detroit to begin with? I'm guessing that thinking about how Letterman influenced your writing caused this to exist. If that's the case can we make you watch the finale once a week during the season? Great stuff sir! I'm kinda inclined to take offense to that jab about not finishing second to anyone but since it was tastefully given by MacT I guess I can forgive it. Especially if his partner in failure is going to look for a former Sabres coach. The Grantland stuff is great, but there's just something special about a classic DGB post. Keep them coming!